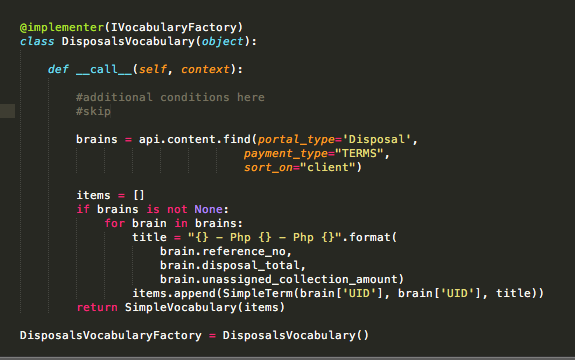 I am using DataGridFieldFactory with a choice field that uses a dynamic vocabulary (IVocabularyFactory). All seems to work fine. I am able to call the vocabulary and able to add the content. But Datagrid calls the vocabulary every second, and calls again if you click the + button of the datagrid to add a new row. 2 initial calls for page load, then calls it infinitely or at least (20 calls ). This makes my add content page to load slowly, and adding a content would take minutessssss. """Return a cachekey based on catalog updates.""" """Default view of Glossary type"""
"""Get glossary entries and keep them in the desired format"""
Also it never hurts to have some caching on your site but I don’t know if it applies in your case. Apologies for reviving this old thread, but I'm trying to solve the same issue @milktea_plone was having. This page shows up in search results, so it may be useful to continue here. Please paste code properly instead of screenshots. Using the HTTP Request example provided in the Annotations documentation, I was able to substantially (50% or more) bring down page load times for content types which have Datagrid fields. Example below is for a product which may be available in up 50 color variations and 5 package sizes. The datagrid may then be filled with attributes such as a suggested retail price, ean etc. for each color/size combination which is available for this product. Colors and sizes may have been stored in the actual product or in a default "master".